Setup Area: 12x12 and 8ft tall. This Little Kids 4 in 1 Small Combo Design Bouncer is small enough to go inside a garage. This is designed for kids 7 and under and no more than 5 kids at a time. 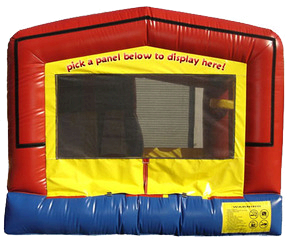 Includes Bouncer, climber, slide, basketball hoop and your choice of panel on the front. Basketball not included, please select from our "Party Extras" to add to cart. You can add a theme to this bouncer by selecting a panel from the next screen at no additional cost. It features an inflatable safety ramp at the entrance to protect excited kids as they scramble to get inside the bouncer. It also has large netted vent windows that keep things cool for the kids and allows parents to keep a watchful eye on all activities inside. Appox 4-5 users at a time.